The long awaited day of becoming a family is finally happening! You have a beautiful baby girl or boy growing inside your tummy and family and friends are buying you gifts to celebrate this beautiful occasion. Your mind is full of lists and ideas of things you will need for you brand new baby. What you will soon begin to notice is baby will need a ton of stuff! So maybe now it’s time to talk about organizing your baby room. You will soon find after your beautiful bundle of joy arrives that they need changed a lot! The changing table will often be used in the middle of the night so you will want to make sure it is organized and easy to use even in the dark of the night. Over time you will figure out what you use the most and will be able to adjust your changing table accordingly. Normally changing tables either have drawers or shelves for you to keep your necessities on but what goes on these shelves will be up to you to figure out. Here are some general ideas to get you started. These are just a few items to get you going and will change as your baby changes. You will want to use baskets and bins to keep them organized and may want to attach a small light near your changing table out of babies reach to keep from turning on the overhead light in the middle of the night. It doesn’t matter if you have a large walk in closet or one of the tiniest. What matters is how you utilize the space inside the closet. Baby’s clothing is much smaller than an adult so you should adjust the closet space accordingly. You will find your closet probably has 2 hanging areas, one high and one low. You should be able to make a little adjustment that will actually allow 3 bar hangers to be hung to hold all of your babyís clothing. After baby is born you will begin to notice that you will have a ton of clothing that baby doesn’t quite fit into yet. Keeping an area in your closet for these items is important so you don’t end up forgetting that you have them. Use plenty of bins and containers to keep baby’s accessories and toys organized and easy to find. Mark your bins well with what is located in them or you will spend a lot of times hunting for an item. Clear containers work well for keeping things organized and if you have some with lids it will help when it comes to stacking. Rooms can get cluttered quickly and honestly baby will not need too much when they are born. There are a few essential items that you will want to have in the room besides the changing table and those are a bed, dresser and a good rocking chair. I only say this from experience as I had purchased one rocking chair and had it setting in the living room. What I didn’t realize is that at 2:00 AM you may not feel like taking those extra steps to your living room to get baby back to sleep. It’s so important to stream line your nighttime feeding schedule and keep things organized and easy. So set yourself up for success and have your changing table and rocking chair ready and waiting for those many times you will be up feeding your little one. While baby is still small you will notice that there is a ton of space under the crib that is hidden by the crib skirt. Grab yourself some bins on rollers and utilize this space while you can. Often times you will get toys from your baby shower that will keep baby busy throughout the younger years. These toys may not be what you baby needs in the first few months so storing them away until he/she is ready is a must. Babies and young children can often get over-stimulated with too many toys available to them so keep it down to a minimum in the beginning. 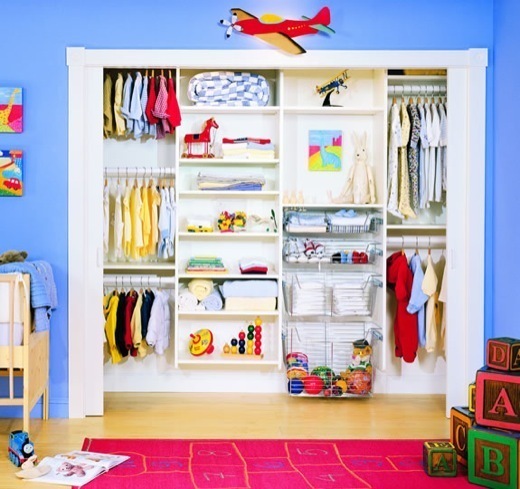 Do you have any ideas that have worked well for you when organizing your baby room?